An Affidavit of Heirship is used to transfer property instead of having to go through probate when a person dies without a will. You need to use an Affidavit of Heirship when all heirs agree to not probate the will. In most situations, the surviving spouse or children compose an Affidavit of Heirship. This establishes ownership of the community property that was owned by the deceased. As long as the deceased’s children are the children of the surviving spouse and the property is not valued at an amount greater than the limits set by state law, the property then transfers to the heirs. Fill out an Affidavit of Heirship with the complete evidence of your family history to determine the legal heirs of the property. Once the affidavit is signed and filed in the deed records, it links the title of the real estate to the heirs. It is at this time, the heirs are allowed to transfer ownership of the property. Instead of going through probate to receive title to the property, the heirs should file an Affidavit of Heirship in the local deed records county office where the real estate was owned by the Decedent. Title companies will accept an Heirship Affidavit to determine ownership of the property. 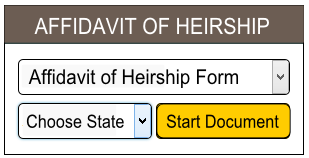 An Affidavit of Heirship form’s sole purpose is to identify the heirs of the estate. The affidavit gives notice, upheld in a court of law, that a person has died intestate, or without a will. The Affidavit of Heirship then establishes title to estate property where the sole asset is real property. With an Heirship Affidavit, you do not need to go through the burden of a court proceeding. It is filed in the county where the property is located and prepared with factual information about the decedent and the assets of the estate. The Affidavit of Heirship is signed before a notary public by two witnesses without connection to the estate. And finally, the affidavit is filed in the real property records on file in the local county clerk’s office where the deceased’s property is located. The court does not appoint an administrator in a determination of Heirship proceeding because no formal administration is necessary. In some rare instances, a financial institution may insist on releasing estate funds to a court-appointed executor or administrator. A decedent must have died without leaving a will. No petition for the appointment of a personal representative is granted. Formal administration is not necessary. Fill out and print a free Affidavit of Heirship form in just minutes online.